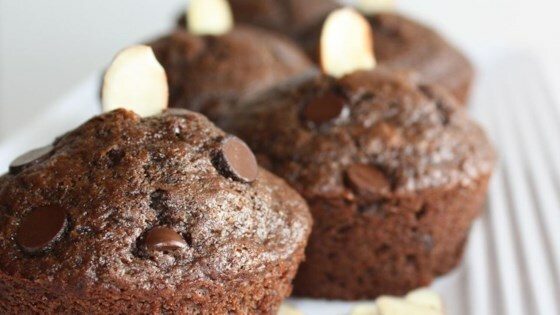 "These are the best chocolate muffins you will ever have!" In medium bowl, Sift together flour, cocoa, sugar, baking powder, baking soda and salt. In large bowl stir in milk, egg, oil and vanilla. Mix dry ingredients to large bowl; beat well. Add chocolate chips and walnuts, stir well. Fill muffin cups 3/4 full. Poke almonds into tops of unbaked muffins. Sprinkle muffins with sugar. Bake for 20 to 25 minutes, or until toothpick inserted in center comes out clean. I made them without the nuts and almonds. they came out moist and delicious! I baked them for 20 minutes and they came out just perfect! I followed the recipe exactly, baked them for exactly 20 minutes, took them to a function, and they disappeared in 15 minutes. Awesome recipe. I followed the exact ingredients, except for spilling some extra vanilla extract in by accident....it turned out really delicious. very fluffy and the chocolate chips in the center were perfect.